Follow Taapsee Pannu through her Official App smarturl.it/TaapseePannu. Download the free Taapsee Pannu app now! Stay connected to Taapsee Pannu on her official app. 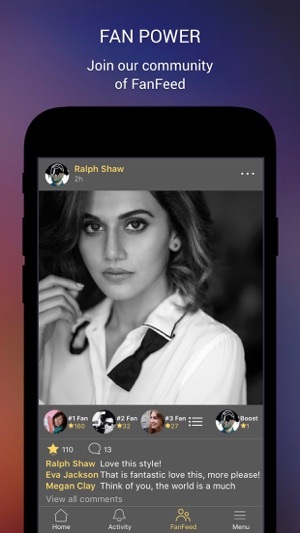 - Boost your comments with Superstars, become a Top 3 Fan, and be seen by Taapsee Pannu. - Follow Taapsee Pannu on social media. Download the Taapsee Pannu app now and #BeSeen! Taapsee Pannu has truly etched a mark for herself in the film business by creating a space unique to herself. One breakthrough performances after the other, Taapsee is today a force to reckon with. Be it her feisty roles in PINK and Naam Shabana or her upcoming romantic avatar in Marmarziyan, her sportsmanship in Soorma or her gutsy power packed role in Mulk: Taapsee is truly ruling with her versatile shades as an actor! I love Taapsee Pannu! I’m so glad she has her own app— which is wonderfully functional, btw!